I told you last month about my super chippy, antique door that I took apart and have been creating things with the parts.I put some sealer on this panel from the door, hoping to preserve as much of the chippy paint that is left, then added hangers to the backs of some ironstone bowls and a platter to hang on it. I love the simple, farmhouse look of the old wood and crazed ironstone together. The piece above it is salvage from an antique accent table. You’ll see another part from that accent table in our whole kitchen remodel. 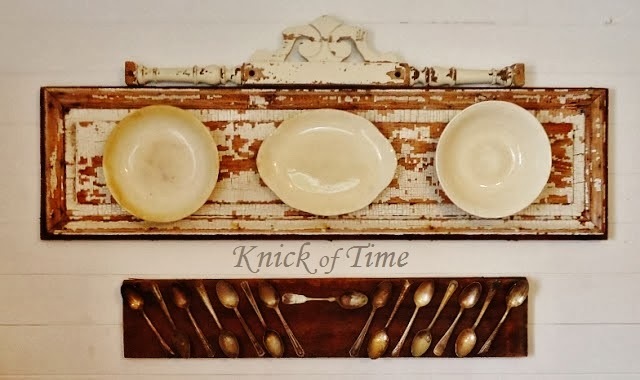 I also wanted to create a way to display my pretty, tarnished silverware spoons, so I used E6000 to mount them to a piece of wood that was leftover from our bathroom remodel. If you recall, the wood in our bathroom came from a historic courthouse that was demolished. The other side of the wood is turquoise, so I used the rough, unfinished side to mount the spoons. The old wood is a perfect backdrop for the tarnished spoons. I had just enough spoons to fill the board. On Friday, I’ll show you another little project I finished for my kitchen as well. I’ll give you a little hint what it is…I think you’ll “see” why I love it. Nope. Not getting tired of your innovative kitchen ideas! Love them both! I’m guessing your next project has something to do with a window? Love the ironstone door display. Great way to showcase plates on the wall! Love that old door with the plates!!! Oh, that display is SO COOL! Love it! LOVE your displays.But stop teasing me LOL! I can’t wait to see your whole kitchen.And NO I am not sick of hearing about it.It is looking amazing my friend! I love these displays. They are charming. what could be better? ironstone, silver, and chippy wood!! Love both of those, great ideas! Gorgeous display! Thanks for linking to Potpourri Friday! Be sure to stop by for the platter giveaway! I love how your plates and spoons are displayed. Great ideas! Those might be two of my favorite projects of yours. If I could pick fav’s in all the great stuff you make. I’m pinning these. I love both of these projects. The old piece of table over the top of the ironstone/door display is genius…gives it the perfect touch! The plates and spoons look gorgeous! Angie, you are SO creative and talented!! I love both of these ‘projects’! I LOVE the way you do things! Very cute! Angie, I love your chippy white door and the tarnished spoons. Thanks so much for linking to the final Hot Fun in the Summertime party. This is a very special link. I love this look. What a creative way to display your plates and your spoon collection! Great job! I just LOVE the spoon idea…I have a drawer full of them and this is a great idea! Looks fantastic! I love the textures, I’m such a texture freak. What a great combo of vintage images! I love the collected synthesized look of the entire image. This is a work of art!!! I just love this Angie! Saw it on Pinterest and had to come over and check it out in detail. LOVE LOVE LOVE! Love the ironstone on the chipped wood. Can’t wait to see your kitchen. You do have a way with a room. Saw some great clocks today. Never enough money….. I like your old door with the plates, fantastic! I remodeled my kitchen 2 years ago with only old furniture, I love that vintage look. This is so cute Angie! Love it a LOT! You always make things so beautiful. I love these with the ironstone and the spoons. What a cute idea with the spoons! I have several old spoons, too! I think I will try to make a spoon display of my own! I love how you used these door panels. I have a pile of them just waiting to be adorned and you have given me some great ideas. Great vignette! I love the ironstone and old silver. Great ideas and no I never tire of looking at others refinishing projects. OMG….I love what you did! !~ Can’t wait to see the entire remodel! 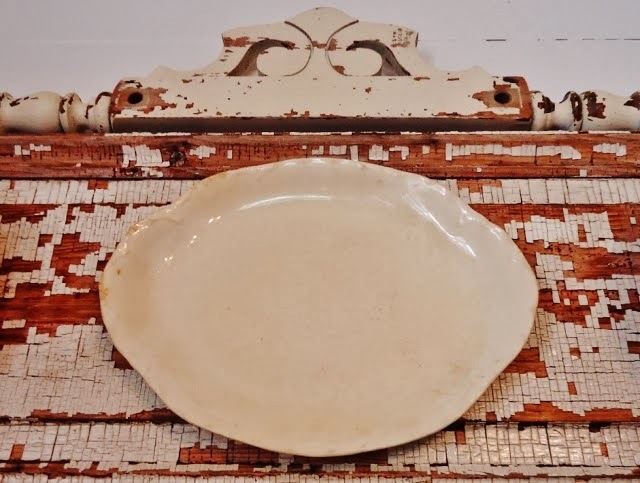 I love it, so pretty, and a great way to highlight ironstone plates. The spoons are so uniquely pretty displayed this way too. Loving the vignette! So glad you shared your creative inspiration with Sunday’s Best – your creativity helped make the party a success! This is absolutely beautiful. What a great way to display. Thanks for sharing at DIYbyDesign. oh i love those pieces!! i would love to do that with spoons! You turned nothing into a work of art. Nicely done. What a creative and beautiful way to display your spoons. I love the chippy architectural piece and the plates look perfect on it. Thanks for sharing this at the Open House party. I adore it! What a charming idea! Sharing at the party tonight~ thanks for linking up at Feathered Nest Friday! This is such a charming farmhouse idea…I’m LOVN’ it!!! This is really pretty, Angie–I particularly like the ironstone plates on the chippy backdrop! A whole lot of chippy love going on over here at my house! The architetural piece is wonderful. Adding the white ironstone was a great idea. The silverware turned out fun also. You amaze me with your creativity. What a pretty and unique display! Love, love, love! What more can I say? Love, love, love it! Creative and fun projects again from you. Can’t wait to see the kitchen reveal. I just had a slap-my-forehead moment. I’ve been trying to figure out how to attach a brass wall pot to some chippy wainscoting I have. After reading about your project, I realize e6000 will do the trick. Thanks for helping me see the light! I love your display! Can’t wait to see the finished kitchen. Hi Angie, I know that this has been featured all over blogland, but throw another shrimp on the barbey. Love it too much not to feature it at Share Your Cup Thursday. Just wanted to mention that I don’t see Share Your Cup listed as links you are sharing with. I’m sure not intentional. Still featuring anyway. Love this….what a great idea…if you would like to share it again…I would love it if you did at Share It One More Time http://www.onemoretimeevents.com/2012/08/features-and-share-it-one-more-time.html. Hi Angie! I am swooning over your spooning! Kind of corny, I know, but how I love your blog and your vintage kitchen! Smiles and thanks to Jann for allowing me to find you through her Share YOur Cup Thursdays! Loving this idea! Great Job!! I’m totally SWOONING over that chippy plank – yum! 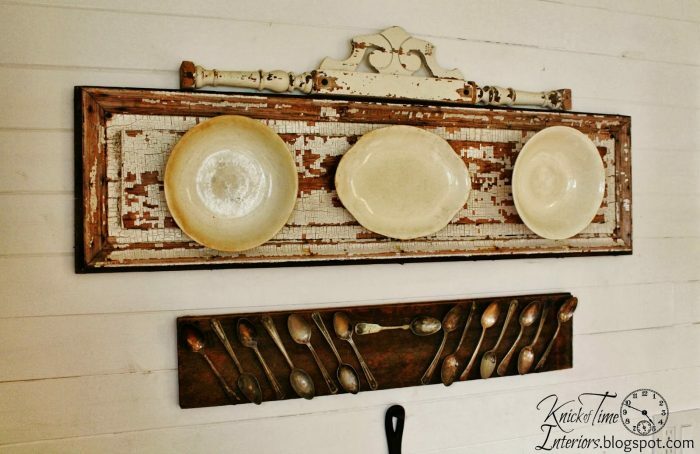 That is a terrific way to to reuse that door and to display the dishes and spoons. Love it!!! Thank you for sharing this at Rustic Restorations Weekend! I’ve seen lots of projects for old doors but have to say your door with the dishes is my favorite. I’m going to keep my eyes open at yard sales so I can make one of my own. Thanks!